Named after the Saffron spice, one of the rarest and most expensive spices in the world, Saffron Restaurant & Bar is a blossoming relaxation spot for both the locals and foreigners . Saffron Restaurant, located at the Silverbird Galleria, Victoria Island, Lagos, caters for assorted client list ranging from celebrities to matured professionals. At Saffron Restaurant, it is reflective of their culture of offering dignified services to a most distinguished clientèle set. 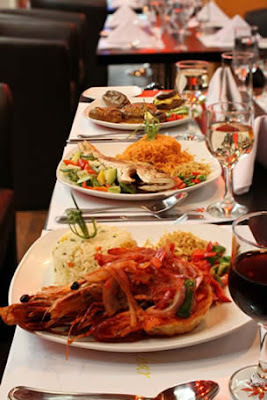 This Victoria Island restaurant offers an eclectic selection of the most exotic cuisines from different continents as created by their world renowned chefs. The food and service are first class, prices are reasonable and competitive. Responding to the rising demand for a more upscale dining experience to suit the buzzing lifestyle of Lagos, Saffron presents to the public varied excitements from diverse culinary cultures in a relaxed and inspiring atmosphere becoming an icon of pleasurable perfection. Impeccably designed to suit the tastes of the exalted clientèle that Saffron was designed to serve. The array of lights and the soulful music stirs a soothing feeling that enthrals the mind and creates the home experience befitting for royalty. Saffron Restaurant & Bar serves their teeming clients a mixture of good food and a sweet mix of jazz and R n B music, making each visit an unforgettable experience. Fired up by the love of food, their line of palate teasing dishes brings to bear an impressive wealth of our gourmet knowledge. At Saffron, our culinary mastery astounds the wise and stretches from traditional to intercontinental dishes. In addition to the beautiful mix of good food and easy music, there is a bar which parades the finest tastes of wines from the best years, making Saffron – a restaurant & bar where you can indulge in luxury and lounge while basking in the elevated peace their ambience offers.